Yvonne McNulty, Ph.D. is a tenure-track Assistant Professor at James Cook University Singapore campus, and a leading authority on expatriate ROI. 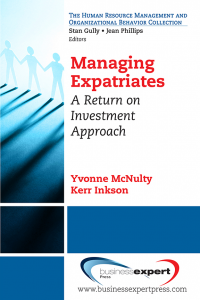 In 2010 Yvonne’s doctoral thesis on expatriate ROI won two ‘Best Doctoral Dissertation’ awards including ANZAM’s best doctoral thesis in Australia and New Zealand. A frequent consultant to Deloitte, Brookfield, ERC, and Cartus, Yvonne’s research has been featured in The New York Times, Economist Intelligence Unit, International Herald Tribune, The Financial Times, and China Daily, among others.